Russell Crowe as the man who built the arc in "Noah." Photo from Paramount Pictures. 'Tis the season, so there is no surprise that bible-inspired films are finding their way into movie theaters. Son of God, starring Diogo Morgado as Jesus Christ, was released on 28 Feb., just days before the beginning of Lent on 5 March. For the uninitiated and forgetful, Lent is the time of year when Christendom stops its devilish ways and commences to acting like it has a savior in Christ. The very one who died a merciless death on a tree before he died, was buried, descended into hell, rose again and is now seated at the right hand of God, the great I Am. This is why so many give up such things as alcohol and sweets at Lent. Why they fast and meditate. And begin doing good deeds. In any case, Hollywood loves to plaster biblical stories across the big screen, with its own spin on the truths, of course. Arriving today in U.S. theaters is Darren Aronofsky's “Noah,” with Russell Crowe starring as the obedient and faithful servant of God. Yours Truly has not and has no plan to see “Son of God.” Nor is there any such plan to take in “Noah,” notwithstanding the great temptation to do so … more shortly. 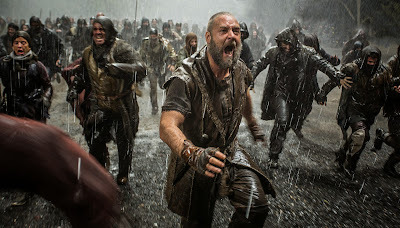 “Noah” is rated PG-13 for violence, disturbing images and brief suggestive content; visit http://www.noahmovie.com/ to learn more about the film.